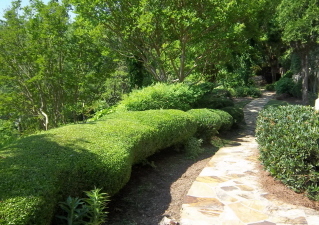 Preparing the garden for a tour, part 5 of a series. – Johntheplantman's stories, musings, and gardening. 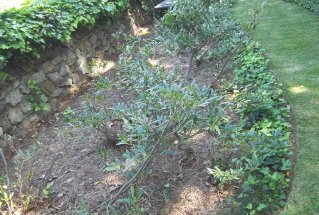 Posted byJohn P.Schulz	 April 15, 2012 May 26, 2014 3 Comments on Preparing the garden for a tour, part 5 of a series. April 15. The season is progressing and we had a bit less than three weeks until the tour. 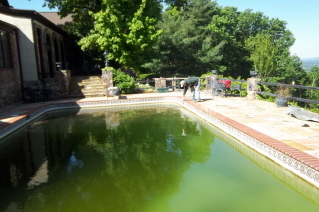 The first thing on the agenda for a Tuesday morning was to take the cover off of the swimming pool. I was afraid to look, but when I did I saw that the water was a nice shade of green, but not as bad as it could have been. I have waited to open the pool until the multitude of wisteria blooms had finished falling. Then, there was another issue in the form of some Schipp’s laurels that had been declining over a period of several years. I have worked on them for quite some time and they have just not responded. Time for them to go. 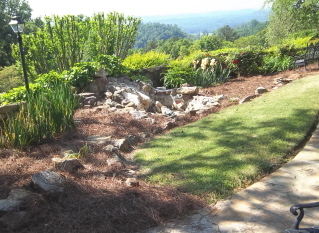 The flower beds are all cleaned and furnished with fresh pine straw. They are now ready to plant but it is still a bit early to plant tender flowers in North Georgia, so I will wait until the final week before the tour. 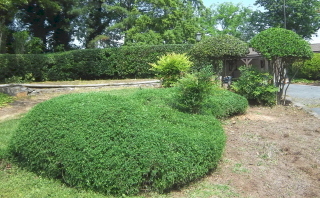 We have worked for years shaping some dwarf yaupons as an entrance for a part of the front walkway. I’m very happy with the way they are looking now. 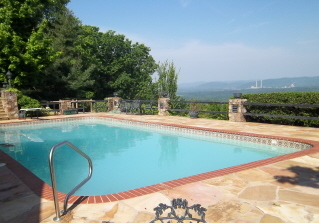 I still have a bit of work to do on the pool, but it’s starting to look good. We will get the water crystal clear next week. 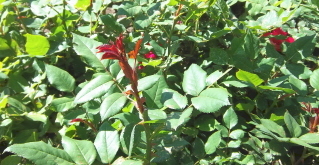 I am happy to see that the knockout roses are putting out new flower buds. My boldness in cutting the early buds just may pay off. I hope so. I have replaced the straggly laurels with some very nice hydrangeas. I think it looks a lot better. I am much happier about this area now. 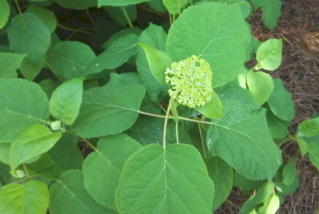 The buds on the Annabelle hydrangeas are developing nicely. 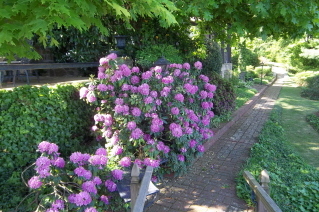 I do think we will have at least some hydrangea flowers for the tour. 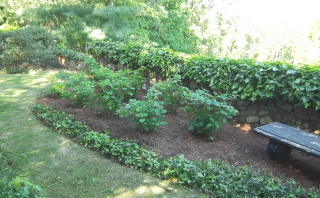 It looks like at least some of the hydrangeas will hit the deadline. 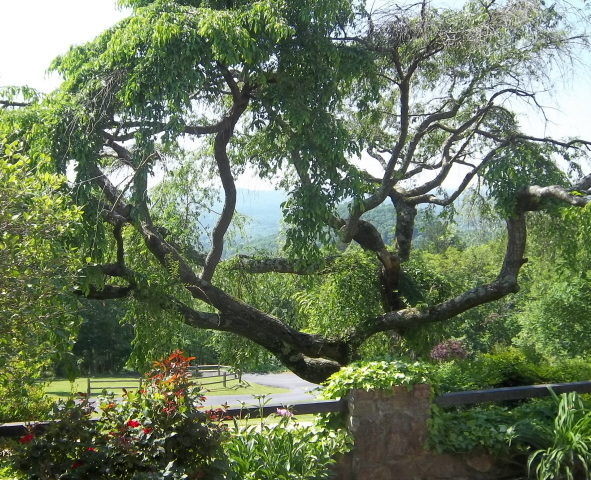 We have tended to the large weeping cherry and I dearly love the way it frames the view of the valley. We’re right on schedule. It has been a most wonderful spring, hasn’t it? You’ve done a top job here, John. I love “before” and “after” photos. It really brings home the full extent of your artistry and,can I say, labour of love? Well done, I thoroughly enjoyed the tour!